I’ve been dealing with a bit of pain in my right shoulder most of this year, possibly brought on by strenuous playing of Wii Sports on our last vacation. 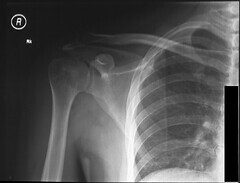 I [literally] shrugged it off, thinking it would go away, but it hasn’t and the joint pain has instead ramped up over the summer to the point that I can’t raise my right arm above horizontal without feeling stabby sensations — and now my left shoulder is beginning to show signs of similar pain and limited mobility. 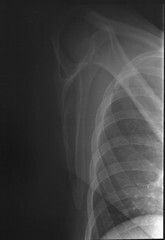 So I’ve been to my primary care physician twice in the past month; the diagnosis: rotator cuff injuries. On the first visit she prescribed diclofenac and shoulder-strengthening exercises. These helped somewhat — until a wall-leaning incident a week ago caused renewed pain, further limiting my right arm’s range of motion and making the exercises more agony than help. Second visit to the doctor ended with an X-ray and a referral to an orthopedic specialist, whom I shall be seeing in October. We’ll see what the orthopedic specialist’s recommendations will be in a couple of weeks. 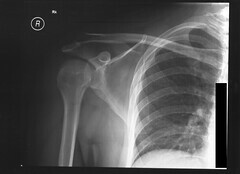 Whether I get surgery or not, I can most likely look forward to months of therapy for both shoulders. In the meantime, enjoy the X-rays. They’ve got bones in them.